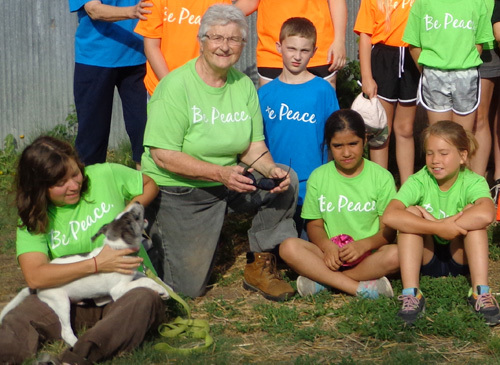 Above: Sister Marilyn Pierson, OP, with campers and staff. Heartland Farm, a sponsored ministry of the Dominican Sisters of Peace, in Pawnee Rock, Kansas, hosted a day camp for 19 children ages 8 to 11 the week of June 1. This year’s camp theme was “Earth, Air, Fire and Water.” Each day featured activities and games related to one of the elements, and Friday the children were shown the connection of all of them through the “Web of Life.” Four Dominican Sisters of Peace live and work at Heartland Farm: Jane Belanger, OP; Mary Ellen Dater, OP; Marilyn Pierson, OP; and Rene Weeks, OP.